<h2>Shelters with echoes thought to be preferred sites for prehistoric rock art</h2><br /><p>Professor Margarita Díaz-Andreu and Dr Tommaso Mattioli, both from the University of Barcelona, Spain, spent two years visiting rock art sites in France, Italy and Spain to compare acoustics and assess their relevance to the choice of location.</p> <p>'In a cliff such as Baume Brune (in Vaucluse, France), with 43 shelters, why were only eight selected to be painted?' said Prof. Díaz-Andreu. 'There are other apparently similar ones nearby that were left empty. Why? '</p> <p>Armed with a specialised portable tool for measuring acoustics, the researchers showed the rock art sites studied have distinct acoustic features.</p> <p>These take the form of either many echoes in the shelters where the art was found, or strong reverberations. At some sites, it was possible to hear sounds from great distances. Other undecorated shelters in the area lacked these special effects.</p> <p>'We found that in all of the areas that we tested, the people who had chosen places to decorate had selected places with good acoustics,' said Prof. Díaz-Andreu, who is also research professor at the Catalan Institution for Research and Advanced Studies (ICREA). In two particular sites, the team demonstrated that the places that were decorated were those with more echoes.</p> <p><strong>Music</strong></p> <p>This suggests that the rock art sites were used for rituals, or religious ceremonies, and may or may not have involved music.</p> <p>'As archaeologists we are obsessed with material culture,' said Prof. Diaz-Andreu, 'But in fact, sound and music are very important to the way in which we feel and the way we react. Sound has special properties that facilitate us to reach a type of mental state that is prone to enhance religious feelings. '</p> <p> <div class="quote-view quotesBlock quote_horizontal"> <div class="quotesTop"><img src="https://horizon-magazine.eu/sites/all/themes/horizon/images/quotes_top.png" alt="" title="" /></div> <p>‘The echoes were most likely perceived to be voices coming from the spirits living within the rock,’</p> <blockquote><p>Margarita Díaz-Andreu, University of Barcelona, Spain</p></blockquote> <div class="quotesBottom"><img src="https://horizon-magazine.eu/sites/all/themes/horizon/images/quotes_bottom.png" alt="" title="" /></div> </div> </p> <p>Dr Jamie Hampson, a researcher at the University of York, UK, who works on a project exploring the modern-day use of rock art (see box), agreed that the rock art has spiritual significance. 'We've got a lot of ethnography from groups in South Africa in particular about the rock face being a veil between this world and the spirit world,' he said.</p> <p>Prof. Díaz-Andreu and Dr Mattioli believe that prehistoric humans may have used echolocation techniques such as tongue clicks, cane tapping and handclapping to select the shelters. However, this is impossible to prove.</p> <p>'Clicking and handclapping do not leave a trace in the archaeological record,' Prof. Díaz-Andreu said.</p> <p>Rock art is found at hundreds of thousands of sites throughout the world. Throughout history, people from all walks of life have used rock carvings, engravings and paintings to express themselves, and the oldest sites found are more than 65,000 years old.</p> <p><strong>Manual rubbings</strong></p> <p>Up until now, researchers have had to take manual rubbings of rock art to analyse in the lab. But this low-tech, 2D and labour-intensive option meant that important data, such as colour and the 3D nature of indentations in the rock, were missing.</p> <p>Now, new zoomable 3D digital models of rock art sites are providing archaeologists with better tools for analysing data – and they could shed light on why certain sites were chosen. They could also help archaeologists work out whether traces at certain sites are man-made or natural, and potentially identify the styles of individual artists.</p> <p>Dr Sue Cobb of the University of Nottingham, UK, led the 3D-PITOTI project, which developed fully interactive virtual replicas of several rock art sites at Valcamonica, Northern Italy, in high detail.&nbsp;</p> <p>She said: 'The archaeologists were looking for a way to analyse the content that they were studying in more detail and in different ways. They wanted a better way to view and compare small details of different rock art figures, identify families of figures, and make the 3D rock art available to their fellow colleagues and the public. '</p> <p>To build the models, the project team developed an entirely new scanning device to collect images of the rock surface. Specially designed to capture the colour of the rock art and intricate details, at the same time it is lightweight and portable enough to be easily transported across inaccessible areas, hence the nickname 'walking-stick scanner'.</p> <p>The scanner is so powerful it can reconstruct surface points at 0.1 millimetre spatial resolution, and uses a high=powered flash.</p> <p><iframe src="https://www.youtube.com/embed/uGMtPyddD4o?rel=0&amp;showinfo=0" width="560" height="315" frameborder="0" allowfullscreen="allowfullscreen"></iframe><p><em>The 3D images allow archeologists to analyse the rock art in laboratory conditions and share their findings in real time. Video courtesy of 3D PITOTI.</em></p> <p>A feature of the finished 3D models is that you can zoom in and out from the images easily, and virtually fly over the sites. To achieve this effect, the team took photographs from near-range, mid-range and far-range locations to capture the rock art from a range of distances and angles.</p> <p>The 3D models can be viewed via a 3D multi-user touch table, a multi-user 3D wall display, or individual tablets. Tourists can use the models in museums and visitor centres, to view rock art that is inaccessible or highly vulnerable to damage.</p> <p>As well as providing a faithful record of art that is one day likely to vanish from exposure to wind, rain and snow, the highly detailed 3D models are helping scientists answer questions such as whether the view from a particular place was important in selecting the site for decoration.</p> <p>'Archaeologists can compare rock art images located in different sites,' said Dr Cobb. 'They ask - is there anything meaningful about those locations and the images of rock art that are placed at that site that can help us understand why that site was meaningful to people at that time? '</p> <p><em>The research in this article has been funded by the EU. If you liked this article, please consider sharing it on social media.&nbsp;</em><br /> <div class="moreInfoBlock"> <h3>Modern-day use of rock art imagery</h3> <p>Rock art sites can be a big tourist draw and scientists have been looking at how the experience can best be managed. Dr Jamie Hampson from the University of York found that visitor perceptions of artwork and the management of rock art sites in South Africa, Australia and the US were enhanced when there were indigenous tour guides and staff at the sites.</p> <p>‘A lot of visitors point out how much more meaningful their experience is if they’re accompanied by a guide who is part of an indigenous group in the area,’ explained Dr Hampson.</p> <p>It’s clear that for many indigenous people, rock art holds a symbolic and spiritual meaning. However, it is often used to create tourist memorabilia, without seeking permission from the relevant indigenous people. 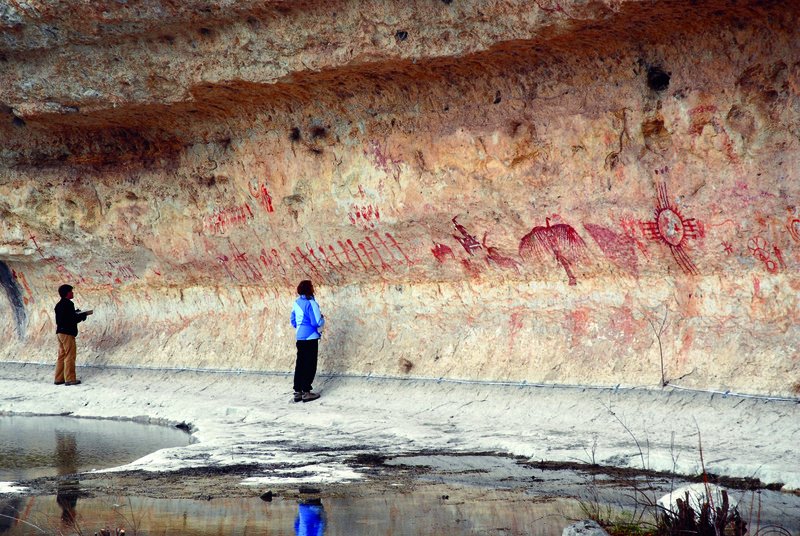 Certain images are considered sacred and are not suitable for this kind of use.</p> <p>‘So much of this is about respect and courtesy and taking all possible measures to ensure permission is granted before images are borrowed,’ said Dr Hampson.</p> <p>The work done by Dr Hampson‘s ROCKART project encouraged the employment of more indigenous staff at heritage sites, and raised awareness about image appropriation. The project also aided several Aboriginal corporations in Australia to set up and run their own rock art visitor centres, fueling entrepreneurship in remote areas.</p> </div> </p> <p><a href="http://bit.ly/newsalertsignup" target="_blank" rel="noopener noreferrer"><em><img src="https://horizon-magazine.eu/sites/default/files/news-alert-final.jpg" alt="" width="983" height="222" /></em></a></p> <br /> <img src=”http://www.google-analytics.com/collect?v=1&tid=UA-40077089-1&cid=shelters-with-echoes-thought-to-be-preferred-sites-for-prehistoric-rock-art&t=event&ec=republish&ea=read&el=shelters-with-echoes-thought-to-be-preferred-sites-for-prehistoric-rock-art&cs=republish&cm=republish&cn=republish&cm1=1" /> This post <a href="https://horizon-magazine.eu/article/shelters-echoes-thought-be-preferred-sites-prehistoric-rock-art.html">Shelters with echoes thought to be preferred sites for prehistoric rock art</a> was originally published on <a href="https://horizon-magazine.eu/">Horizon: the EU Research &amp; Innovation magazine | European Commission</a>. The acoustic qualities of a rock shelter may have been a key factor in its selection as a site for rock art and indicate a spiritual significance to the practice, according to a recent study, while scientists are also looking into whether some caves were chosen as artistic sites because of the view. Professor Margarita Díaz-Andreu and Dr Tommaso Mattioli, both from the University of Barcelona, Spain, spent two years visiting rock art sites in France, Italy and Spain to compare acoustics and assess their relevance to the choice of location. Armed with a specialised portable tool for measuring acoustics, the researchers showed the rock art sites studied have distinct acoustic features. These take the form of either many echoes in the shelters where the art was found, or strong reverberations. At some sites, it was possible to hear sounds from great distances. Other undecorated shelters in the area lacked these special effects. 'We found that in all of the areas that we tested, the people who had chosen places to decorate had selected places with good acoustics,' said Prof. Díaz-Andreu, who is also research professor at the Catalan Institution for Research and Advanced Studies (ICREA). In two particular sites, the team demonstrated that the places that were decorated were those with more echoes. This suggests that the rock art sites were used for rituals, or religious ceremonies, and may or may not have involved music. Dr Jamie Hampson, a researcher at the University of York, UK, who works on a project exploring the modern-day use of rock art (see box), agreed that the rock art has spiritual significance. 'We've got a lot of ethnography from groups in South Africa in particular about the rock face being a veil between this world and the spirit world,' he said. Prof. Díaz-Andreu and Dr Mattioli believe that prehistoric humans may have used echolocation techniques such as tongue clicks, cane tapping and handclapping to select the shelters. However, this is impossible to prove. 'Clicking and handclapping do not leave a trace in the archaeological record,' Prof. Díaz-Andreu said. Rock art is found at hundreds of thousands of sites throughout the world. Throughout history, people from all walks of life have used rock carvings, engravings and paintings to express themselves, and the oldest sites found are more than 65,000 years old. Up until now, researchers have had to take manual rubbings of rock art to analyse in the lab. But this low-tech, 2D and labour-intensive option meant that important data, such as colour and the 3D nature of indentations in the rock, were missing. Now, new zoomable 3D digital models of rock art sites are providing archaeologists with better tools for analysing data – and they could shed light on why certain sites were chosen. They could also help archaeologists work out whether traces at certain sites are man-made or natural, and potentially identify the styles of individual artists. Dr Sue Cobb of the University of Nottingham, UK, led the 3D-PITOTI project, which developed fully interactive virtual replicas of several rock art sites at Valcamonica, Northern Italy, in high detail. To build the models, the project team developed an entirely new scanning device to collect images of the rock surface. Specially designed to capture the colour of the rock art and intricate details, at the same time it is lightweight and portable enough to be easily transported across inaccessible areas, hence the nickname 'walking-stick scanner'. The scanner is so powerful it can reconstruct surface points at 0.1 millimetre spatial resolution, and uses a high=powered flash. The 3D images allow archeologists to analyse the rock art in laboratory conditions and share their findings in real time. Video courtesy of 3D PITOTI. A feature of the finished 3D models is that you can zoom in and out from the images easily, and virtually fly over the sites. To achieve this effect, the team took photographs from near-range, mid-range and far-range locations to capture the rock art from a range of distances and angles. The 3D models can be viewed via a 3D multi-user touch table, a multi-user 3D wall display, or individual tablets. Tourists can use the models in museums and visitor centres, to view rock art that is inaccessible or highly vulnerable to damage. As well as providing a faithful record of art that is one day likely to vanish from exposure to wind, rain and snow, the highly detailed 3D models are helping scientists answer questions such as whether the view from a particular place was important in selecting the site for decoration. Rock art sites can be a big tourist draw and scientists have been looking at how the experience can best be managed. Dr Jamie Hampson from the University of York found that visitor perceptions of artwork and the management of rock art sites in South Africa, Australia and the US were enhanced when there were indigenous tour guides and staff at the sites. ‘A lot of visitors point out how much more meaningful their experience is if they’re accompanied by a guide who is part of an indigenous group in the area,’ explained Dr Hampson. It’s clear that for many indigenous people, rock art holds a symbolic and spiritual meaning. However, it is often used to create tourist memorabilia, without seeking permission from the relevant indigenous people. Certain images are considered sacred and are not suitable for this kind of use. ‘So much of this is about respect and courtesy and taking all possible measures to ensure permission is granted before images are borrowed,’ said Dr Hampson. The work done by Dr Hampson‘s ROCKART project encouraged the employment of more indigenous staff at heritage sites, and raised awareness about image appropriation. The project also aided several Aboriginal corporations in Australia to set up and run their own rock art visitor centres, fueling entrepreneurship in remote areas.